Negotiate - This provider will attempt to use Kerberos for authentication if it is available. NTLM - This provider will attempt to use Windows NT LAN Manager for authentication. IIS 10.0 The <providers> element was not modified in IIS 10.0. IIS 8.5 The <providers> element was not modified in IIS 8.5. IIS 8.0 The <providers> element was not modified in IIS 8.0. IIS 7.5 The <providers> element was not modified in IIS 7.5. IIS 7.0 The <providers> element of the <windowsAuthentication> element was introduced in IIS 7.0. IIS 6.0 The <providers> collection replaces the IIS 6.0 NTAuthenticationProviders metabase property. 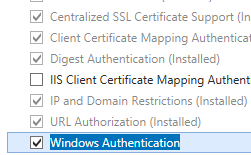 The default installation of IIS 7 and later does not include the Windows authentication role service. 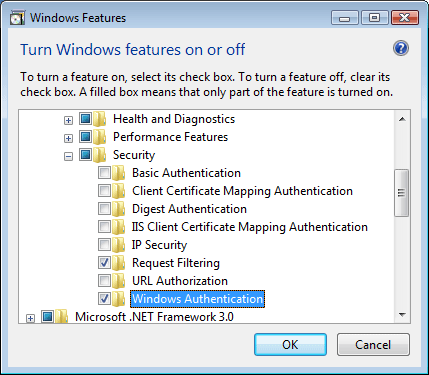 To use Windows authentication on IIS, you must install the role service, disable Anonymous authentication for your Web site or application, and then enable Windows authentication for the site or application. 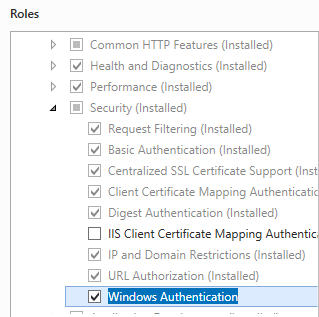 After you install the role service, IIS 7 commits the following configuration settings to the ApplicationHost.config file. On the Server Roles page, expand Web Server (IIS), expand Web Server, expand Security, and then select Windows Authentication. Click Next. Expand Internet Information Services, expand World Wide Web Services, expand Security, and then select Windows Authentication. 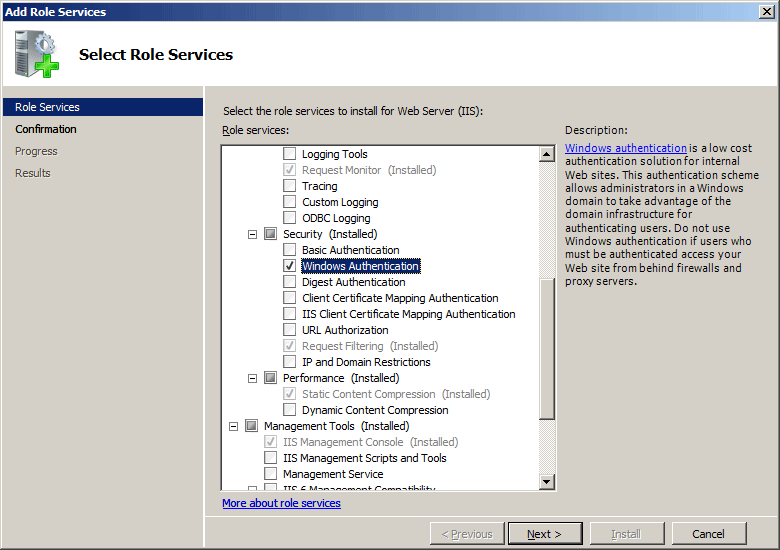 On the Select Role Services page of the Add Role Services Wizard, select Windows Authentication, and then click Next. Select Windows Authentication, and then click OK. 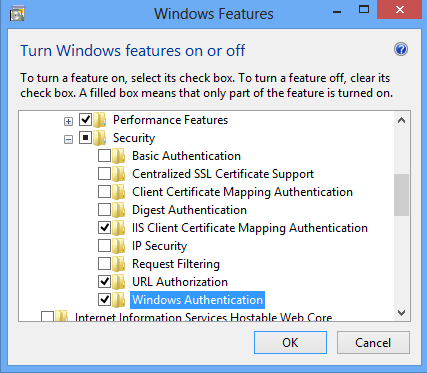 There is no user interface for Windows authentication providers for IIS 7. 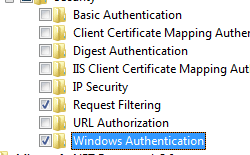 For examples of how to modify the list of Windows authentication providers programmatically, see the Code Samples section of this document. Adds a security provider to the collection of providers. 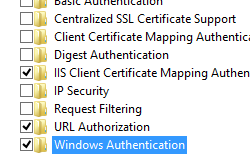 Windows authentication requires at least one provider. Removes a reference to a security provider from the providers collection. Removes all references to providers from the provider collection. The following default <windowsAuthentication> element is configured at the root ApplicationHost.config file in IIS 7.0, and disables Windows authentication by default. 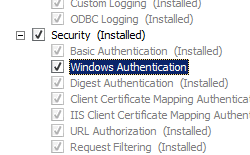 It also defines the two Windows authentication providers for IIS 7.0. The following example enables Windows authentication and disables Anonymous authentication for a Web site named Contoso. The following code examples will enable Windows authentication and remove the Negotiate provider for a site named Contoso.